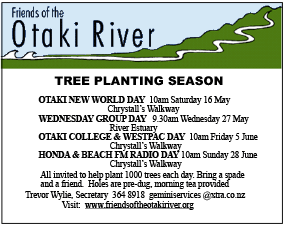 Friends of the Otaki River embark on another busy planting season commencing Saturday 16 May with the Otaki New World Planting Day. 5,100 native trees and plants are currently in the nursery and ready to be planted out. New World have been strong supporters of the ‘Friends’ selling copies of the book Otaki River. All proceeds have been utilised on river planting and enhancement. Otaki College students have assisted potting and preparing 1,000 plants which they will plant on Arbor Day Friday 5 June. Westpac Bank contributed $5,000 toward the college planting project with the “Friends’ Four public planting days are programmed in total, three will take place along Chrystall’s Walkway’ with one day at the river estuary. With great support from Friends members and people of Otaki and district, 1,000 – 1,200 trees will be planted each day. 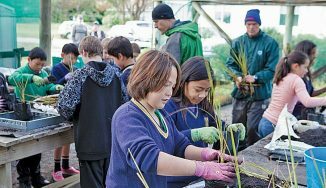 Since the Friends commenced restorative planting on the Otaki River around 60,000 native trees have been planted. These are establishing well and create a most attractive walk to Chrystall’s Lagoon.